I love cooking dishes that are considered “one-pot meals”. I like eating from a bowl and eating all the nutritious ingredients all mixed together. Food doesn’t have to be pretty, they just have to be nutritious. I call a meal-in-a-bowl “rustic”. 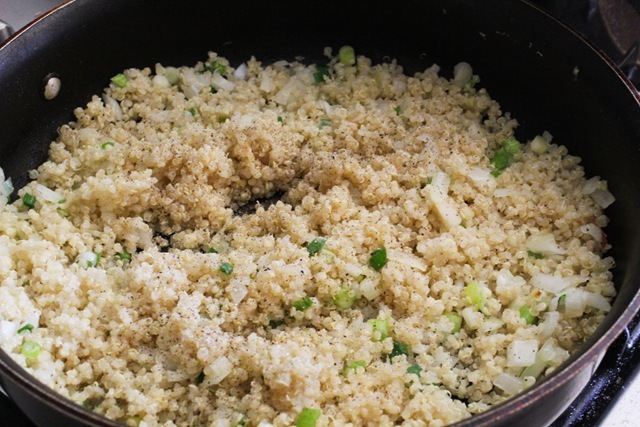 One of my Sunday food-prep is to cook a pot of quinoa to eat throughout the week. 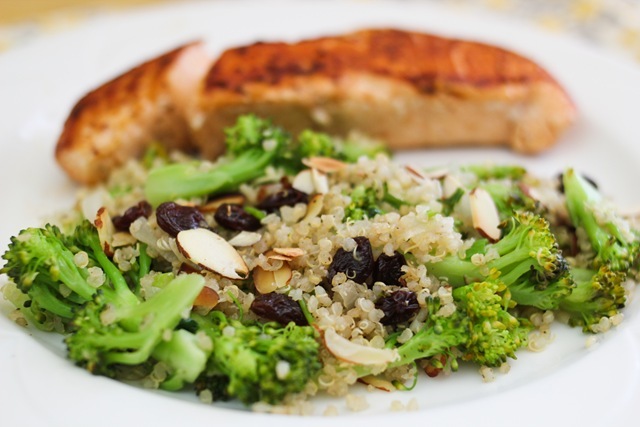 I actually prefer quinoa over brown rice because it’s much more versatile in incorporating it in our meals. 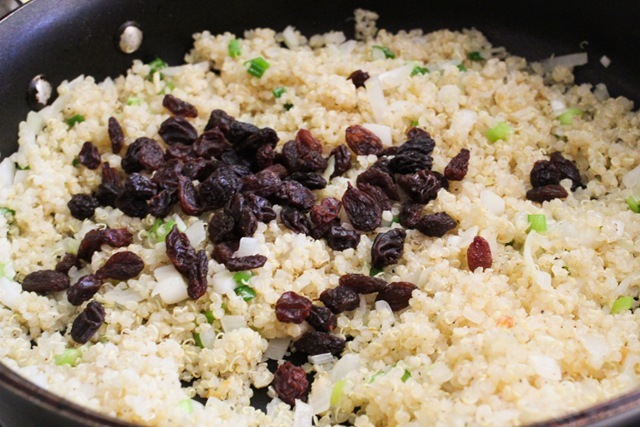 I made a quinoa pilaf dish last Sunday and it didn’t make it past Wednesday. So I woke up early the following morning and cooked the same dish before work. Yes, I liked this dish that much. All the ingredients taste so well together, especially the raisins. I didn’t follow the recipe directions exactly because I cooked the quinoa first before I decided to make a pilaf out of it. So here is my revised version. I started first with onions. This the base flavor for the dish. Add cooked quinoa and seasoning. 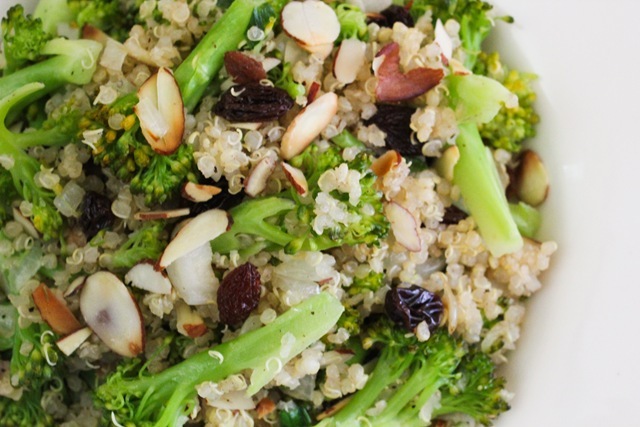 Raisins, broccoli and toasted almonds goes next. It’s very simple and quick. Heat 1 teaspoon of the oil in a medium saucepan over medium-high heat. 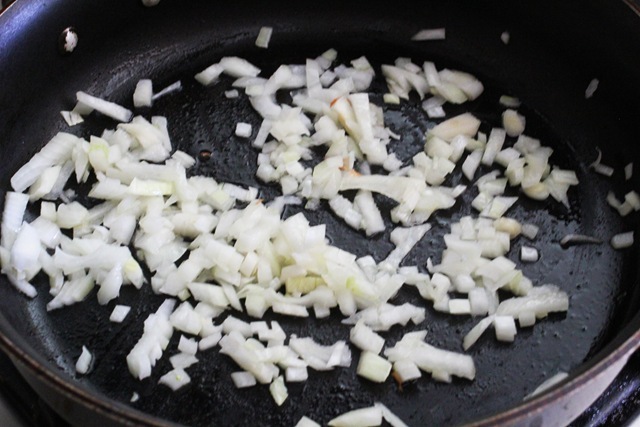 Add the onion and season with ¾ teaspoon salt and ¼ teaspoon pepper. Cook, stirring occasionally, until softened and starting to brown, 3 to 4 minutes. 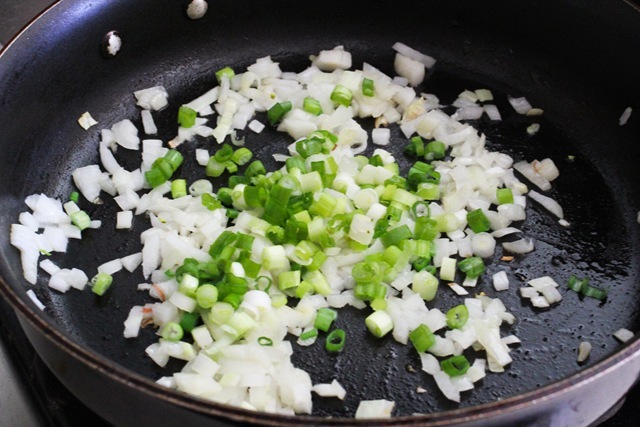 Add the scallions and sauté for a few minutes. Add 2 cups cooked quinoa. 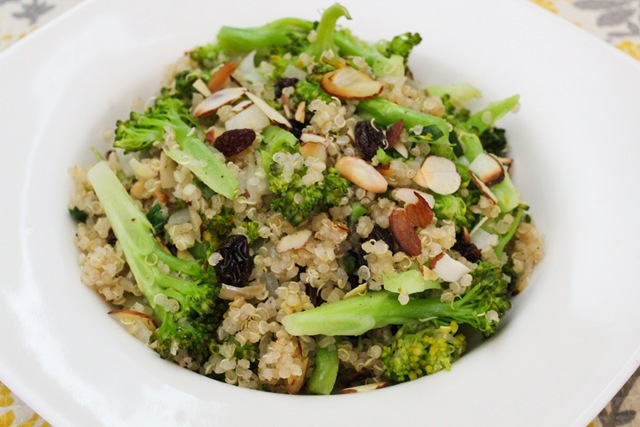 Fold the broccoli and raisins into the quinoa mix. 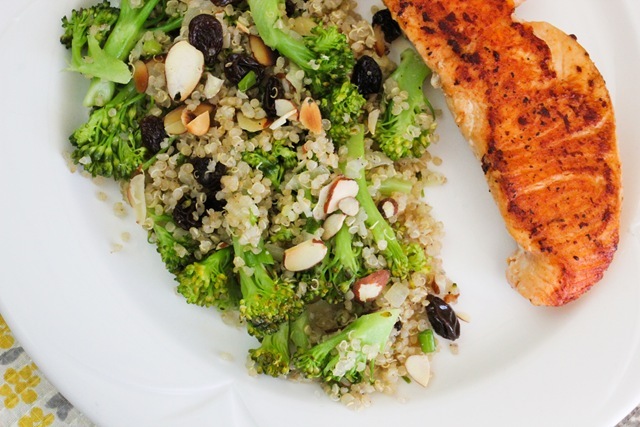 Remove from heat and fold in the almonds, ½ teaspoon salt, and ¼ teaspoon pepper. I ate the pilaf with salmon. I ate the leftovers for my work lunch with boiled eggs. Do you do any food prep on Sundays? This looks delicious! I’m always wary of putting fruits in savoury meals for some reason, but this sounds so good that I may just have to try it! I don’t necessarily do food prep on a Sunday, but I’m always making muffins and snack bars and freezing them for snacks on-the-go. I’ve also recently started making baked oatmeal and freezing portions for quick breakfasts as I’m about to start an early morning nannying job – that way all I have to do is heat them up and cover them in peanut butter and I’m ready to eat on the run. YUM! I made a salad with different lettuces and veggies for this week’s lunches. Also, have leftover Trout, Tri Tip and Ribs for the week. Been a little busy today:) Have a Great Week! Looks SO delicious! Bookmarking this recipe and your blog right now!